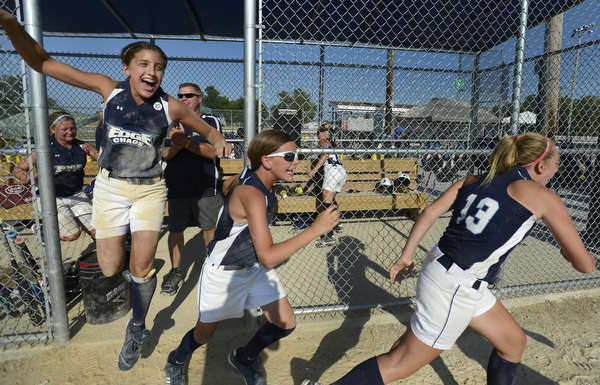 The Edge Chaos (Plainfield, Ill.) clear the bench after defeating the Lady Lasers Purple (Mount Gilead, Ohio) at Green Valley Sports Complex in Moline on Wednesday, August 1, 2012. I hadn’t had time to think about what I was doing. I had my whole life packed in my Camry, and I was headed for Iowa. I’d never been to the Midwest. I hadn’t seen the cheap studio apartment I was about to move into (even in pictures). I never considered the relative absurdity of this whole plan until I was rolling out of town, a week after I graduated from RIT. I took a deep breath, and turned up the Springsteen. I was bound for a summer in the Quad Cities, on the border between Illinois and Iowa, with the Dispatch & Rock Island Argus. The experience was fantastic. This summer, I zip-lined for the first time, covered a whole lot of PGA golf, photographed (not shot) presidential-hopeful Mitt Romney, and rode in the MetLife blimp. On my first day, I joined staffer Paul Colletti on an assignment at a vineyard, where we were told not to photograph an old, rusted Kubota tractor. “I don’t want people to know we don’t use Deere.” I chuckled, but she wasn’t joking. John Deere is a big deal around here. I was given my first solo assignment later the same day, and was essentially treated as a staffer for the rest of the summer. I was typically given two assignments each day, which afforded me time to stay longer and work on picture packages or multimedia. The print edition still comes first, of course, but I enjoyed being able to expand on assignments. Our DOP, Todd Mizener, always made sure multimedia work got good exposure online, and on at least one occasion, got some extra space in the paper for a small feature photo package. It was a great summer in the Quad Cities. I found that the most valuable part of an internship is simply the frequency and variety of assignments. As we were taught at RIT (obligatory William Snyder shout-out), it’s essential to get a few safe frames first. At a baseball game, that probably means photos of the home team’s pitcher and a batter. After that, you’re free to experiment (during one single-A baseball game, I went up on a nearby bridge over the Mississippi River, with the sun setting behind me, and shot with a 400, and made two frames that are currently in my portfolio). Of course, the experimentation time is usually what yields the best images, though they’re not always right for daily news usage. I learned a lot this summer, and I’m grateful for the opportunity that Paul and Todd gave me. Seeing a new part of the country and getting to work on a daily basis is just about all I could have asked for.